At left, purple loosestrife invades a cattail marsh off Route 9 West in Westborough. Cattails are growing in the middle, between the purple loosestrife in the foreground and in the distance. At right, a spike of loosestrife. Purple loosestrife has definitely invaded Westborough, filling sun-drenched wetlands with purple and possibly threatening native plants such as cattails and the animals that may depend on them. The drama of purple loosestrife versus cattail is being played out in many very visible locations in Westborough. You can witness this contest in the wet area next to The Willows on East Main Street, in the fenced-off wet basins by Gibbons School on Fisher Street, along the shores of Mill Pond, and off Route 9 between Otis Street and Route 135. The contest is just beginning in back of Mill Pond School, in the fenced-off basin there. In fact, look for it almost anywhere that purple catches your eye. Purple loosestrife (Lythrum salicaria) is a lovely but invasive summer wildflower that originally came from Europe. It can outcompete common cattails (Typha latifolia), a widespread native marsh plant that had food value for Native Americans and early colonists and today supplies food and protection for wildlife. Ships first brought purple loosestrife seeds to this continent in their ballast. This sand or gravel served to stabilze the ships and was released on our shores. As early as the 1830s, purple loosestrife was established in coastal waterways in the northeast. People continued to import the plant for gardens and old-time medicinal uses. It appeared in Worcester County by 1883. Today, it grows in all of our mainland states except Florida. Twenty-nine states list it as a noxious weed. What is the likely outcome of the purple loosestrife invasion? In the short run, in Westborough, it's likely to be more purple. In the long run, the result remains to be seen. Some experts predict that purple loosestrife will take over the wetlands it invades, becoming the only plant in large stands. In this scenario, it outcompetes the previous vegetation and deprives the birds and other animals that depended on it for food, cover, and nesting materials. Other experts think that over time a new balance among plants, animals, and insects will eventually be established, preventing purple loosestrife from taking over. They point out that purple loosestrife doesn't run rampant in Europe, where it came from. A likely reason is that several insects eat it, keeping it in check in European wetlands. What makes purple loosestrife such a strong competitor here? One big reason is that North America doesn't have its predators--the insects that feast upon its leaves and flowers in Europe. There has, in fact, been some attempt to change this situation. In places across the and Canada, some of these insects--a couple of beetles and a couple of weevils--have actually been introduced in an effort to control purple loosestrife. By the same token, purple loosestrife may have an advantage here because it's not a favorite food of our native animals. For example, North America (including Westborough) is home to muskrats. They'll nibble purple loosestrife stems, but they much prefer the stems and roots of cattails. In wetlands where both plants grow, the muskrats can inadvertently help out the purple loosestrife by eating more of the cattails. In addition, muskrats can create good places for purple loosestrife to get started when they dig out their dens and leave disturbed bare soil on the shore outside the den. Another reason that purple loosestrife is a strong competitor is that it produces a vast number of seeds. One big, well-established, bushy plant can produce more than 2 1/2 million seeds in a season. The seeds germinate readily, even under water. They can also remain dormant in the soil for years, building up a large "seed bank" that keeps new seedlings coming for many years. The seeds germinate best in sunny, damp, bare or disturbed soil. When our water levels drop, due to drought or heavy local use, the newly exposed shores make ideal places for purple loosestrife to get started. You can see in the accompanying photo how purple loosestrife invades the edges of a swamp or marsh and moves inward from there. Seedlings send down hardy taproots and can flower and produce seeds in their first year. When shoots or rootstocks are nibbled or damaged, the plant responds by sending up more shoots. A cut or broken stem that gets partly buried can take root. Purple loosestrife is a hardy perennial. Individual plants can live 22 years or more, and they become bushy with age. Established plants can withstand flooding, thanks to special tissue that forms in the roots with air spaces between the cells. Mature plants can also tolerate a few dry years. What can you do if you don't want purple loosestrife coming into a wet area on your property? Probably the best thing is to remove it when it first invades. You can pull up new plants before they get too well established. Later on they become difficult to pull or dig up, and fragments of the roots will sprout again. 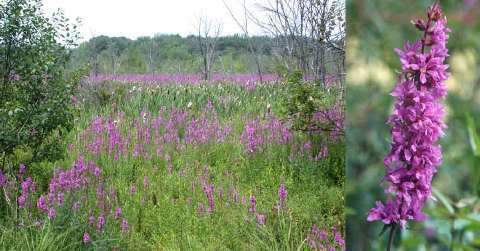 What conditions are not favorable to purple loosestrife? The plants don't like shady banks, cool temperatures (below 50 degrees), and short days (fewer than 13 hours of daylight). The news about purple loosestrife isn't all bad. It's hard to ignore the beautiful color that it lends to the summer landscape. Deer, rabbits, and muskrats sometimes graze on it. Red-winged blackbirds and American goldfinches are among the birds that nest in it. A variety of butterflies visits the flowers. Purple loosestrife is pollinated mainly by honeybees and can be be important to beekeepers, especially in the middle of the summer when other flowers are scarce. Folk medicine treated diarrhea and dysentery with tea made from purple loosestrife. People also gargled with it for sore throats and used it to wash wounds and treat bleeding.